Is é Aerfort Londain-Gatwick an dara aerfort is mó i Londain. Tá sé suite ó theas ó Londain, in Sussex. 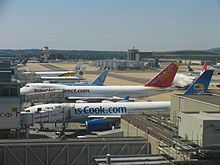 Is é Gatwick an ochtú aerfort is fiche is mó ar domhan i dtéarmaí paisinéirí. Tá dhá chríochfort ag an aerfort - An Críochfort Thuaidh agus An Críochfort Theas. Tugadh an leathanach seo cothrom le dáta an 9 Márta 2013 ag 16:03.